Do you live in one of the happiest places in Iowa? According to a Harris Poll taken in October of 2015, only a third of Americans say they are truly happy. That’s too bad, considering that Americans – especially folks in Iowa – don’t really have it too bad, in the grand scheme of things. And, we crunched the numbers on the best (and worst) states to live in America last summer, and Iowa was 2nd, right behind Nebraska. So, sounds like things are peachy keen in the Hawkeye State. But, we were curious – which Iowa cities might be the happiest? We’re about to find out, using science and data. Read on below to see how we crunched the numbers and how your town ranked. If you have a smile on your face, you probably live in one of these cities. 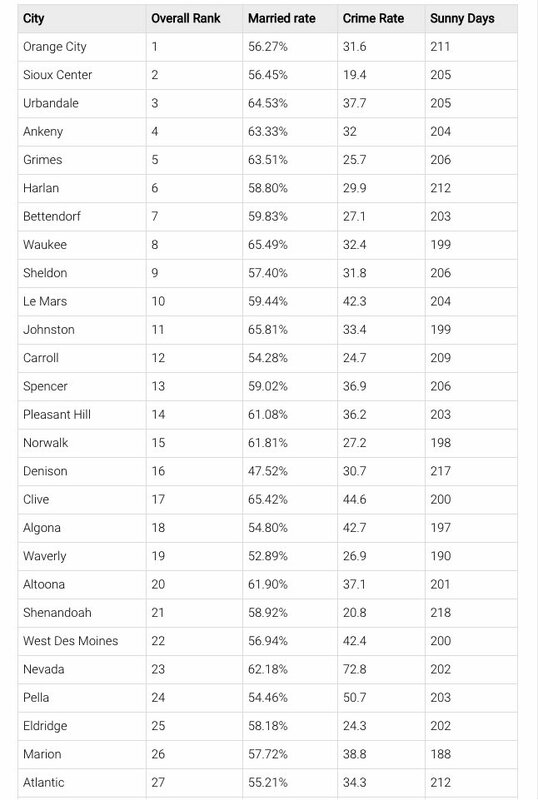 There’s a chart below the quick summary with the top 25 happiest cities in Iowa, and more detailed statistics. Oh, and by the way, sadly, Keokuk is the saddest city in the Hawkeye State. How do you decide if a city in Iowa is happy or not? In order to rank the happiest places in Iowa, we had to determine what criteria makes people happy. It isn’t a stretch to assume that happy people earn great salaries, are relatively stress free, have a stable home life and live where the weather is nice. For geo-located Tweets, we used #happy. It wasn’t even close. When we crunched the numbers, little ole’ Orange City is the happiest place in Iowa. Let’s see why. First of all, where is Orange City? We’re glad you asked; it’s the county seat of Sioux County, a short drive from South Dakota. Actually, this part of the state is apparently really happy since Sioux Center was 2nd on the list. What makes Orange City such a skippity-do-da place? Almost 80% of residents own their own home, which is the 2nd highest rate in the state. And, just about everyone has a job (the unemployment rate is 2.8%), and short commutes to work (10 minutes each way). Plus, does sunshine on your shoulders make you happy? It sure does. Studies have shown that a lack of vitamin D is not only bad for you physically, it can really wreck havoc on your emotions. Well in Orange City, they get 211 sunny days a year – good enough for 7th highest in the state. 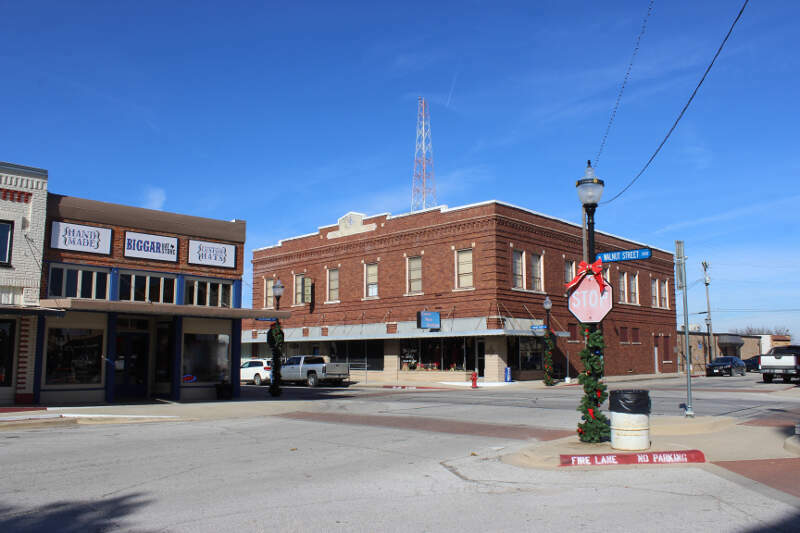 The population in Orange City has climbed 7% in the last 10 years. No wonder the population is exploding here. Everyone wants to be around happy people. Urbandale (3rd happiest): This affluent suburb located a short drive from Des Moines has some really happy couples. More than 64% of the population is married (which is 4th highest), and they are the 3rd wealthiest and 5th highest employed in the state. There’s nothing like coming home from a great job to a loving spouse every night. West Des Moines: On the happier side of things, WDM ranks 22nd (out of 84 cities with a population over 5,000). What makes West Des Moines a relatively happy place? They are 10th in college degrees (79%), and 9th in income levels. What sets it back? The cost of living is just about the highest in the state, and only 58% of the population owns a home. Plus, crime is about average. Nearby Des Moines might not be happy to hear that they’re not so happy – at least in the grand scheme of things. Why? It’s the 10th most dangerous place, according to the FBI. Yes, we’re aware that dangerous in Iowa is a lot safer than dangerous in, say, Illinois. But, when comparing cities across the board, it’s one of the happiest places for criminals. Des Moines also ranked in the bottom 20 in married rates (46%), homeowners (58%) and unemployment (4.8%). Add it up, and they’re the 14th most miserable city in the state. Cedar Rapids: The 2nd largest city in the state is ho-hum about things. At least that’s what the data says. Cedar Rapids ranks just about in the middle for most categories. Cedar Rapids is in the bottom 10% for sunny days (193) and top 10% for intelligence, where more than two-thirds of residents finished college. Happiest in the burbs? Many of the cities that scored the highest for happiness in Iowa are suburbs of major cities – specifically Des Moines. Maybe the saying, ‘Loving the simple life,’ applies to Iowans. Miserable in Iowa: The following cities scored the worst: Keokuk, Fort Madison, Oelwein, Waterloo and Manquoketa. Davenport wasn’t too far behind at No. 10 from the bottom. Like we said earlier, trying to determine the happiest cities in Iowa is usually a subjective matter. But if you’re analyzing cities where people are not stable, where it’s dangerous and the weather is bad, this is an accurate list. Here’s a link to the complete data chart for mobile users. Desktop users are able to see a breakout chart below..
We also wrote about the 10 Drunkest Cities In Iowa if you want another light-hearted study. Below is the desktop version, with more detailed stats. Mobile users can click on the link above for the complete statistics.